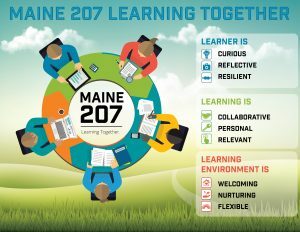 Maine Township District 207 is in the process of rewriting its Vision of Learning. To that end, we began engaging stakeholders in the 2017 – 2018 school year to define the desired attributes and outcomes of learning our schools. The graphic below is a first step in communicating this vision to our stakeholders and the world-at-large. Please visit this page often as the graphic will become an interactive portal to communicate our community’s vision of learning and what that means for all our stakeholders.